﻿ Mission | Bridgestone India Automotive Products Pvt.Ltd. 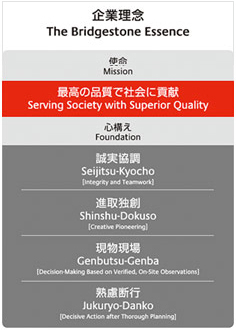 Shinshu-Dokuso is about envisioning the future and proactively challenging ourselves to identify and develop innovations that will further benefit society and respond to customer needs - from the customer's point of view. It is about unleashing creativity and innovation to develop new business domains and creating demand for new and beneficial products through our own unique methods.